The tradition of the pianist-composer features some of the best-known names in music, among them Mozart, Beethoven, Chopin, Brahms and Rachmaninov. 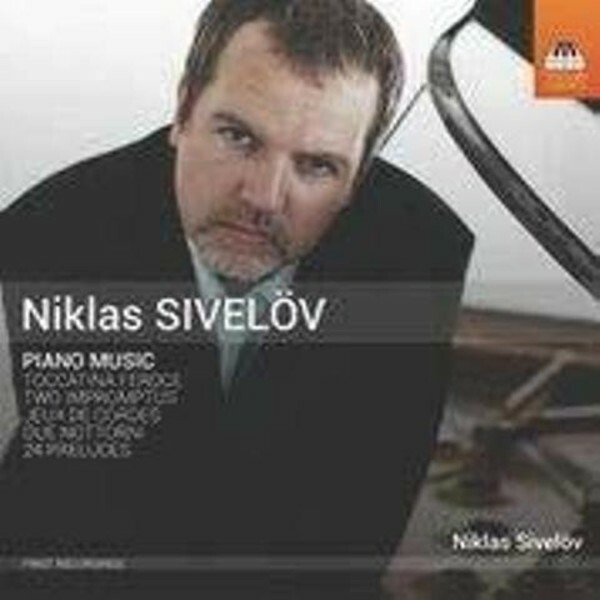 Now the Swedish pianist Niklas Sivel�v joins their ranks in this first-ever recording dedicated to his own compositions. Another tradition is the composition of 24 Preludes, and this set, written between 2010 and 2014, takes its place in the tradition established by Chopin, Scriabin, Shostakovich and many others. This recording presents some of his early compositions and some of his most recent, with music coloured by a range of influences, from Bach to jazz. The composer supplies the booklet essay himself, explaining what he was trying to achieve in each piece. Niklas Sivel�v � a professor at the Royal Academy of Music in Copenhagen � is one of the leading pianists in the Nordic countries. He was born in Skellefte� in northern Sweden and began playing the organ at the age of six. When he was fourteen, he switched to the piano and studied at the Royal College of Music in Stockholm from the age of seventeen. He made his debut, playing Bart�k�s Second Piano Concerto, in 1991, and since then the conductors he has worked with include Thomas Dausgaard, Alan Gilbert, Esa-Pekka Salonen, Jukka-Pekka Saraste and Leif Segerstam. This is his first recording for Toccata Classics.